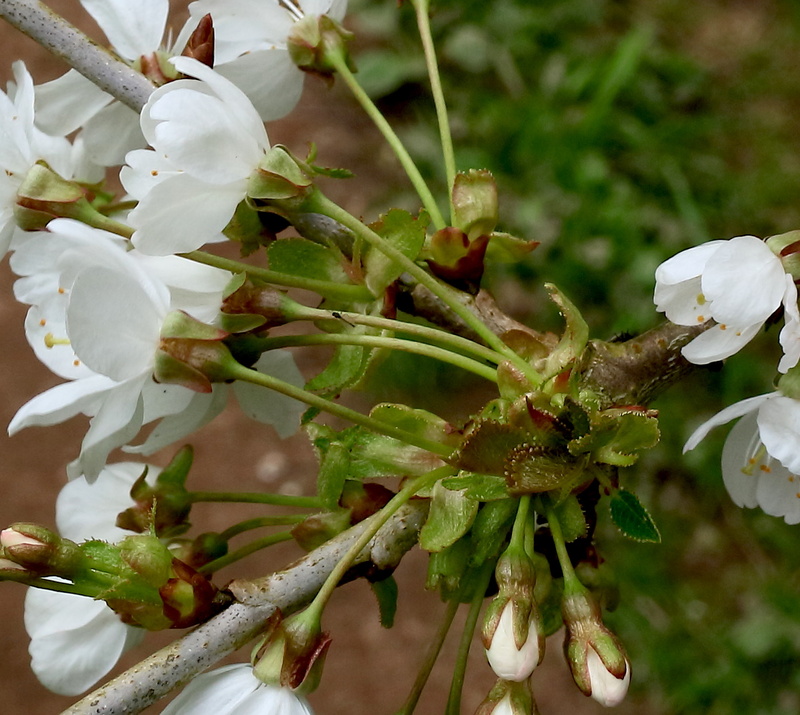 (True) Cherries (two species) have clusters of several flowers arising from a single point, the bases of the flower-stalks surrounded by a ‘rosette’ of bud-scales. 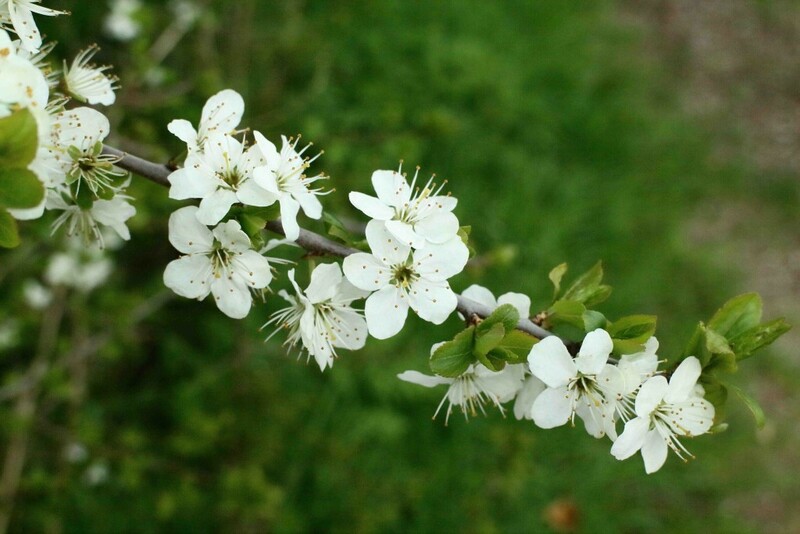 Plums (three species) have only one, or two, flowers arising from each spot, with no bud-scales at the base of the flower-stalks. 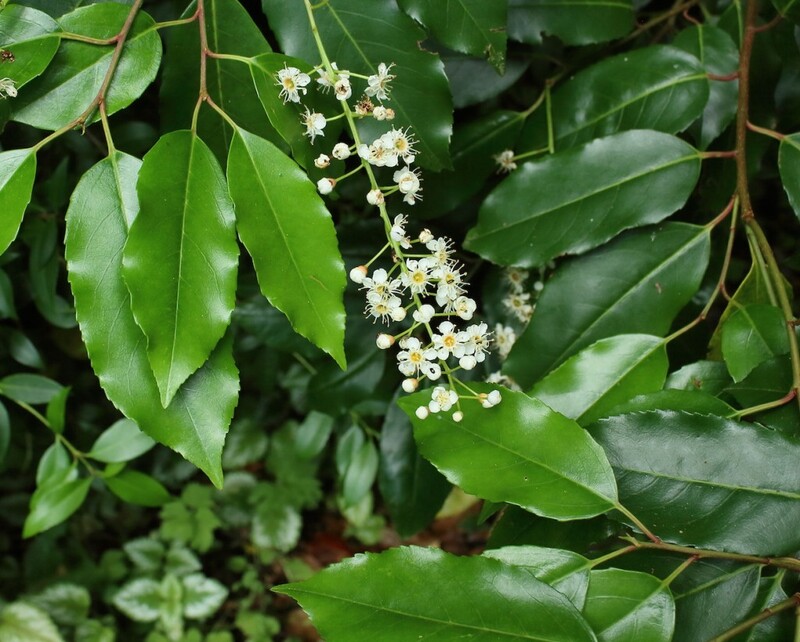 Bird Cherry, Prunus padus, and the introduced Cherry Laurel, P. laurocerasus, and Portugal Laurel, P. lusitanica, have smaller flowers in racemes: i.e. flowers grow “along a stalk”. 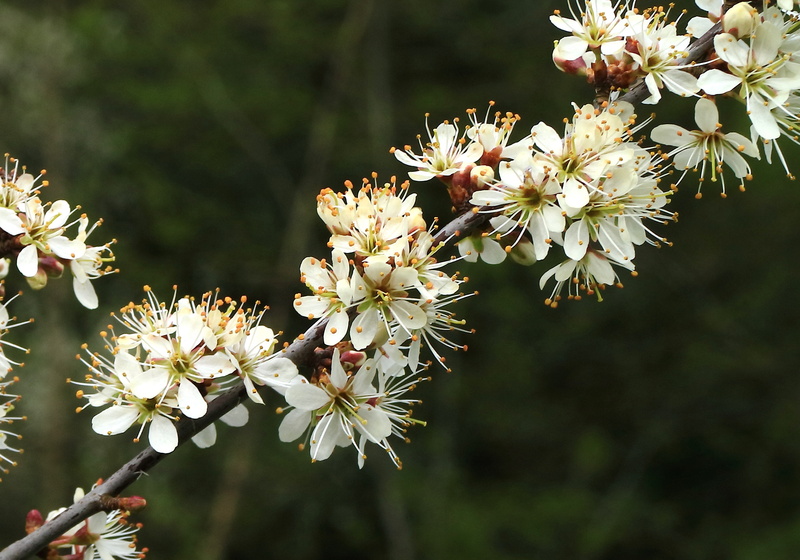 Cherry Plum, Prunus cerasifera, is a true ‘plum’, having flowers arising singly or in pairs. 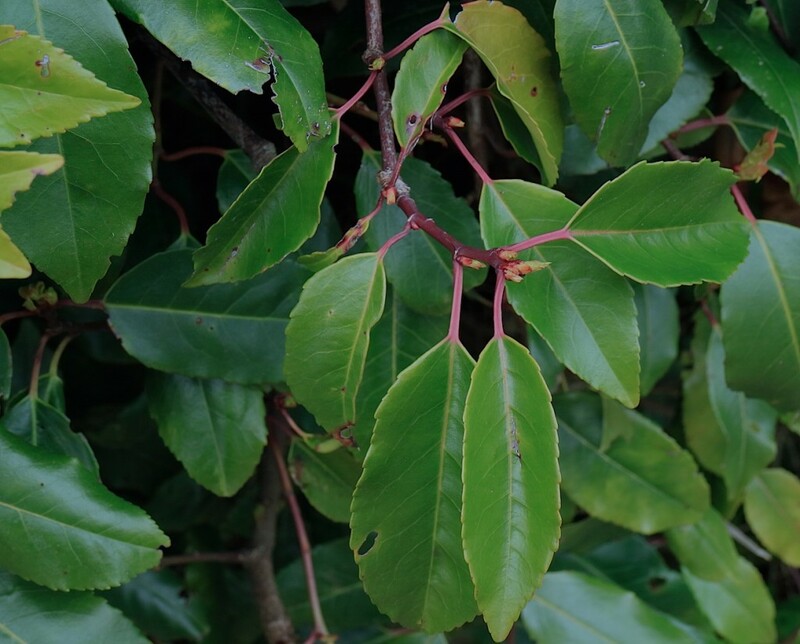 The young twigs are hairless and distinctively green: no other Prunus has green twigs. 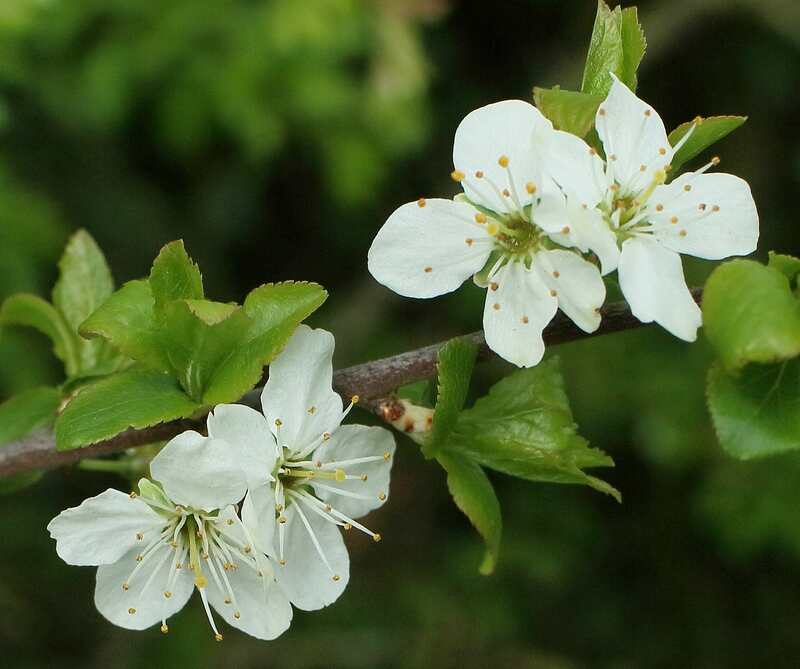 The leaves develop with the flowers, unlike Blackthorn, which flowers on ‘bare branches’. Often in cut hedges, along with Blackthorn, when easily overlooked, except by its early flowering, but can make a small tree, looking distinctly wispy with slender branches and twigs, and quite pale bark. Can begin to flower even as early as late January, but particularly strong in March and into April. Scattered, but locally frequent and probably overlooked. 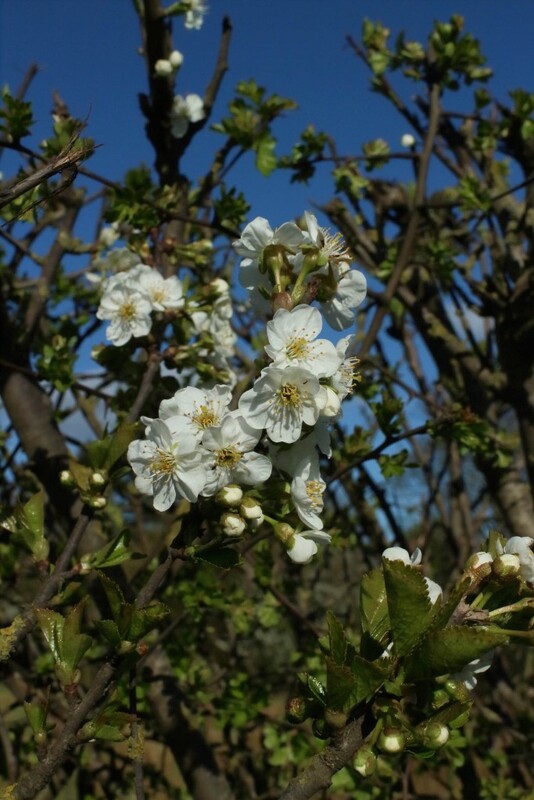 Not native, and probably always planted, rather than naturalised, as it fails to fruit in most years in Cumbria. Selections such as ‘Pissardii’ (below – this or a similar cultivar: I’m not a horticulturalist!) have delicately rose-flushed flowers, and note that the twigs are ‘sunburned’ to red-brown, even when young. 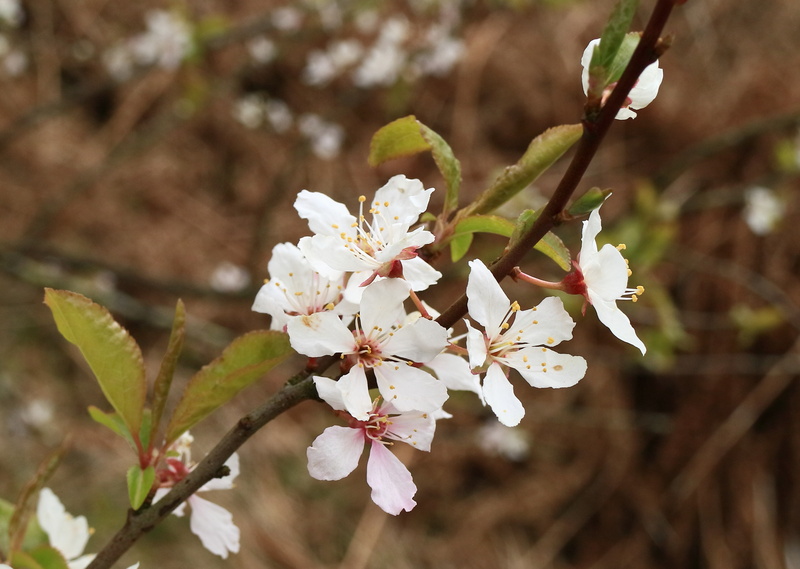 The earliest of the strongly pink-flowered/purple-leaved cherries in gardens is ‘Nigra’ (and similar), a form of P. cerasifera that flowers weeks before the various flowering-cherries. 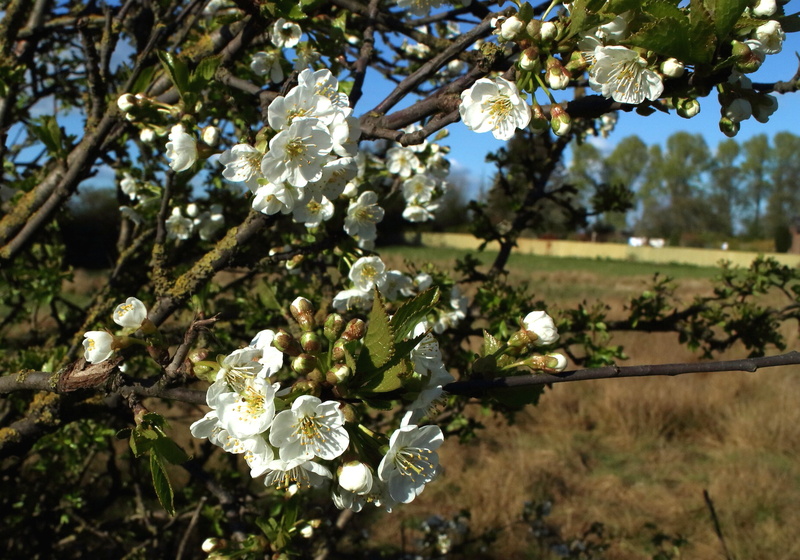 Blackthorn, Prunus spinosa, is very familiar as a hedge. Very strongly suckering, and so – where allowed – can make an impenetrable mass of very spiny straight-branched black-barked bushes. 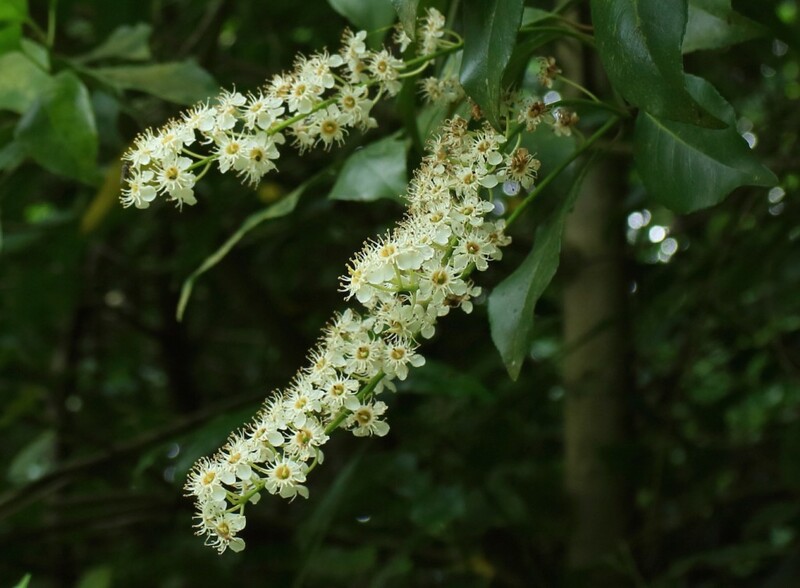 The second Prunus to flower after Cherry Plum, the flowers appearing before the leaves start, so making a distinctive pattern of white flowers against dark bark, and no green visible. Flowers small: petals 5-8 mm. Abundant. 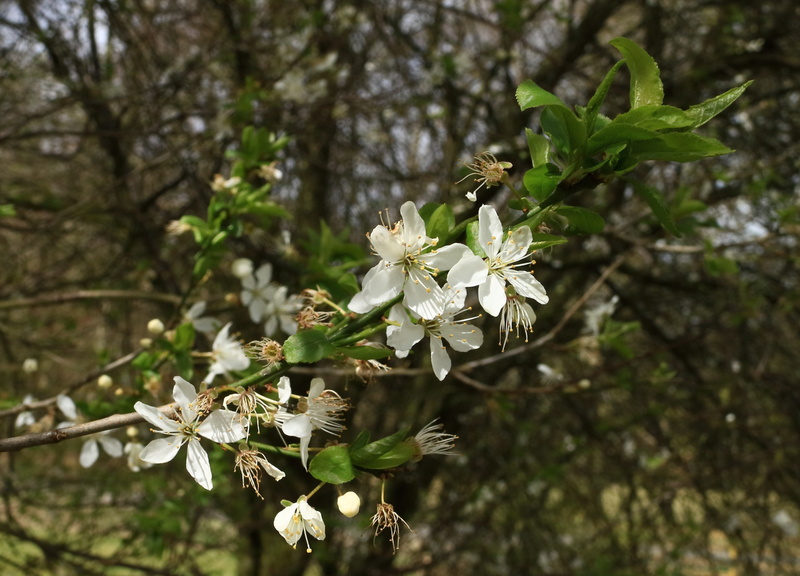 Plum, Prunus domestica, tends to flower a little later than Blackthorn, and can make a small tree, either non-spiny or at least (in some forms) less spiny. 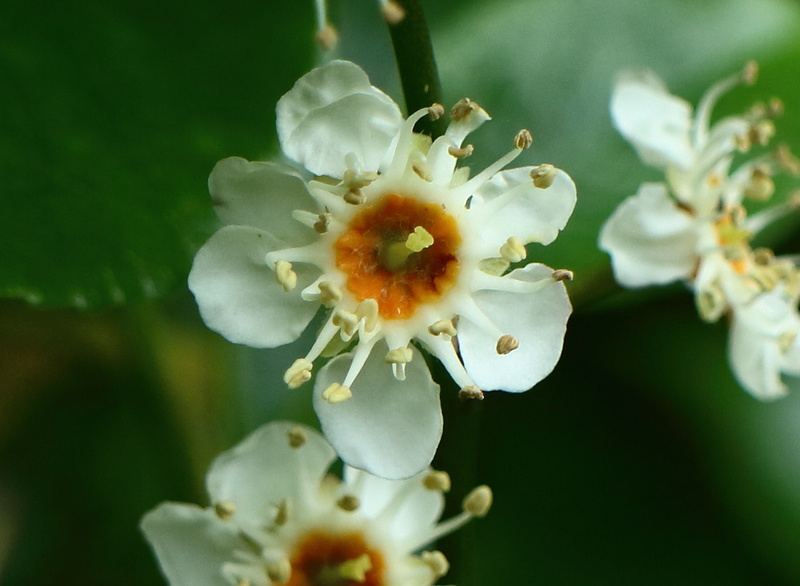 Flowers are larger, 7-12 mm, and less dense than in Blackthorn. Usually the leaves appear at the same time. 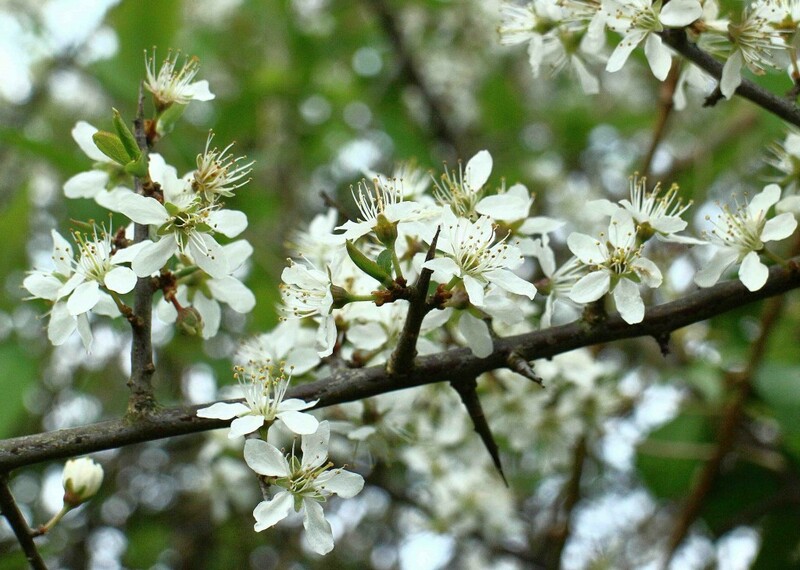 Plum includes the cultivated Bullace, Damson, Greengage, and cultivated Plum. Both this and Blackthorn are very variable; they hybridise to make a fertile hybrid, so some plants are difficult to identify. 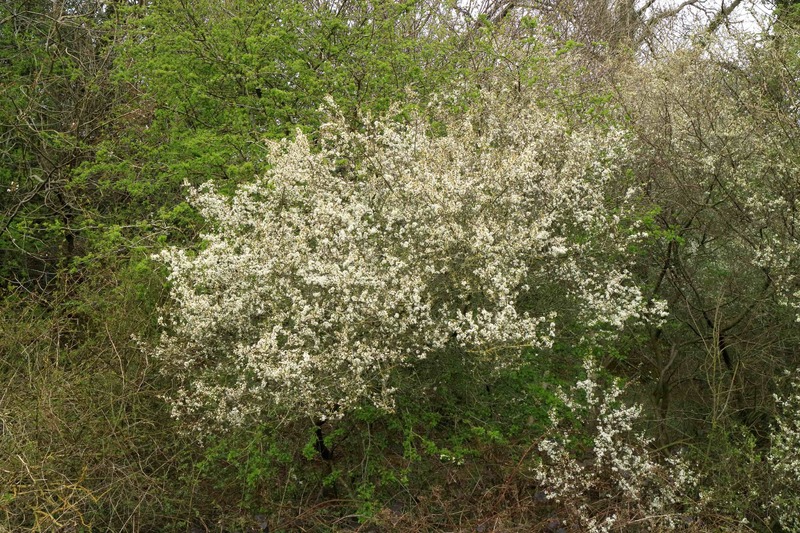 Scattered, and easily overlooked as Blackthorn. 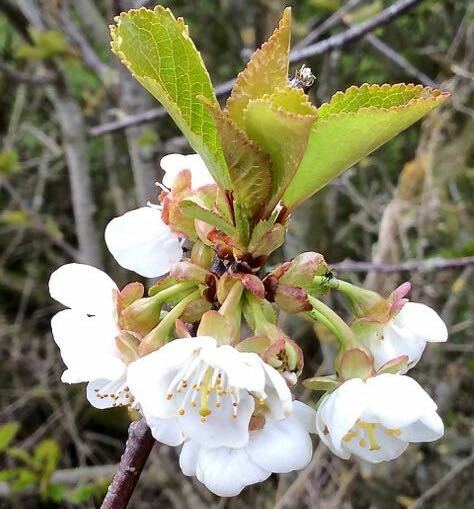 Wild cherry, or Gean, Prunus avium, starts flowering in mid-April, typically, and is easy to identify with its clusters of dangling long-stalked flowers, arising from rosettes of bud scales (lower picture), the flowers cup-shaped and often flushed somewhat cream or pink. Leaves are somewhat downy underneath (unlike the next), and become large and somewhat wrinkled. Often makes a large tree, with shiny reddish bark with horizontal scars. Abundant in hedges and open woods. 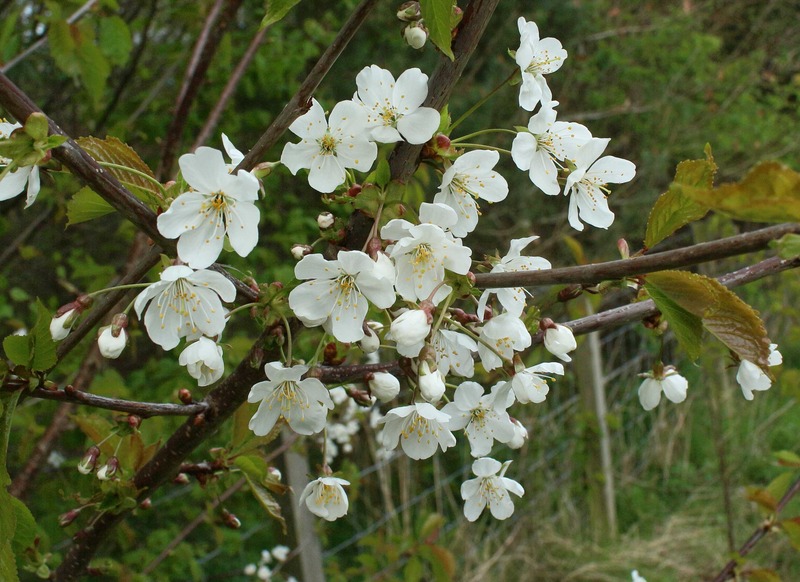 Dwarf Cherry or Sour Cherry, Prunus cerasus. Usually a shrub, and often strongly suckering. 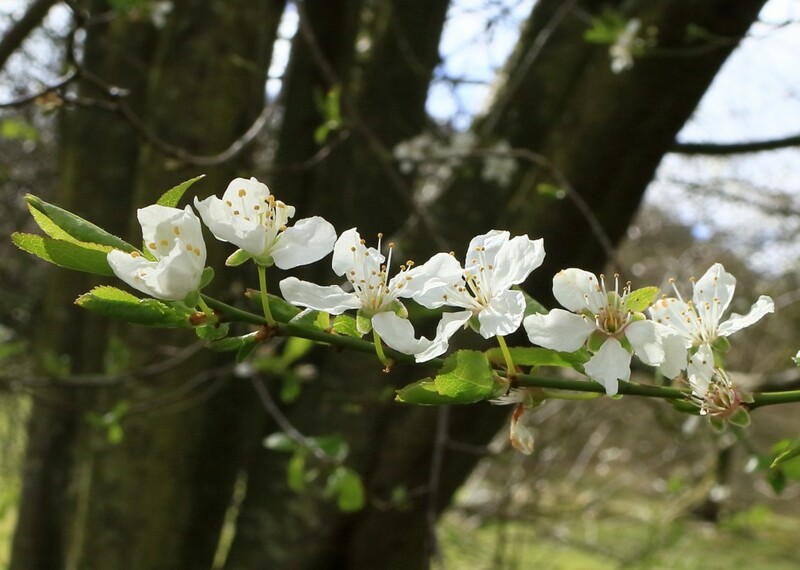 Clearly a ‘cherry’ from its clusters of flowers, but compared to Wild Cherry the flowers are pure white and wide saucer-shaped rather than cup-shaped, on much shorter stalks, so making dense clusters. 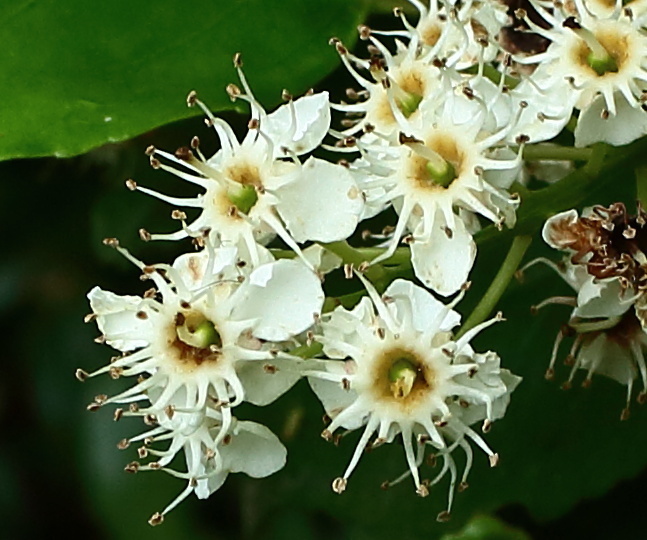 As can be seen in the third photo, like Wild Cherry, but unlike Blackthorn and Plum, the flower-clusters arise within a ‘ruff’ of bud-scales, which may become leaf-like. 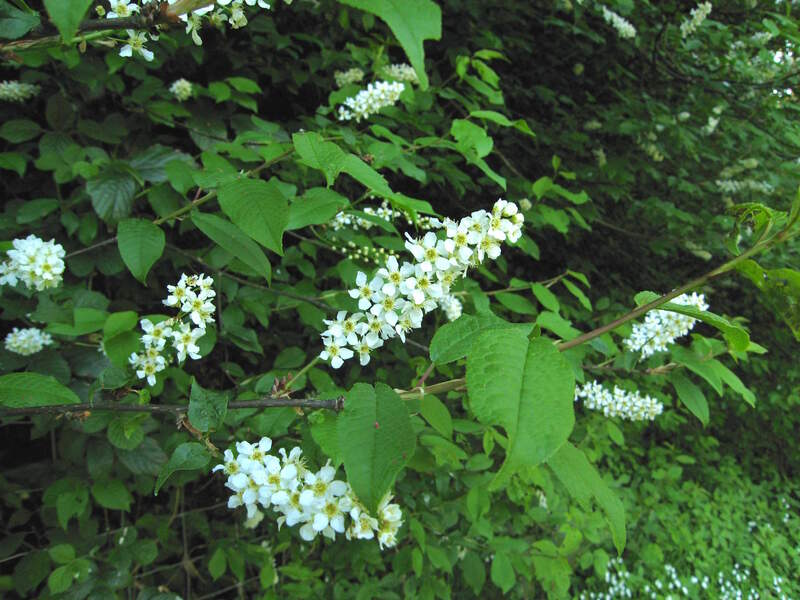 The leaves, smaller than in Wild Cherry, are shiny, and hairless underneath. Seems to be rare, but probably overlooked. Not native, and perhaps always planted and not naturalized. 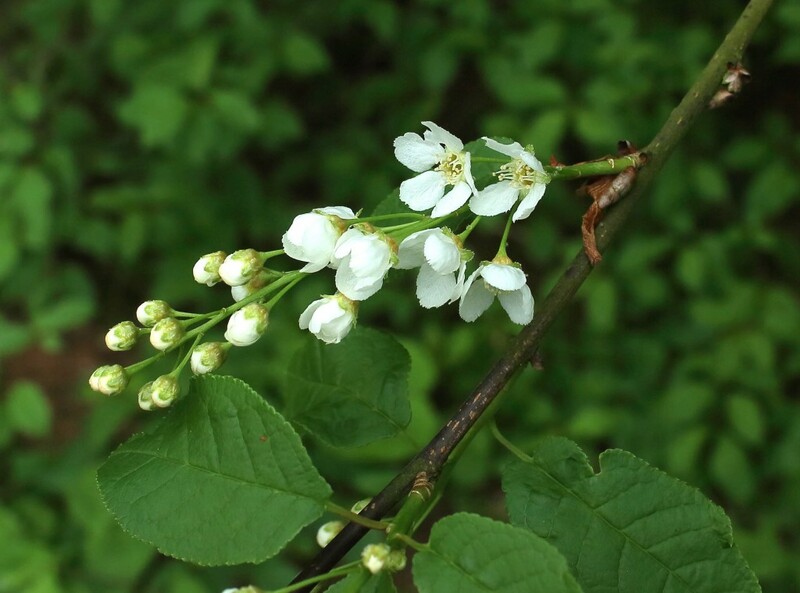 Bird Cherry, Prunus padus has smaller flowers in racemes (i.e. flowers grow “along a stalk”, not from a single point). It flowers later – into May or beyond at higher levels. Very variable in growth: in the hills it can make a large open bush, often sprawling on steeper slopes, but typically in more sheltered and stable sites makes an upright tree. Quite common. 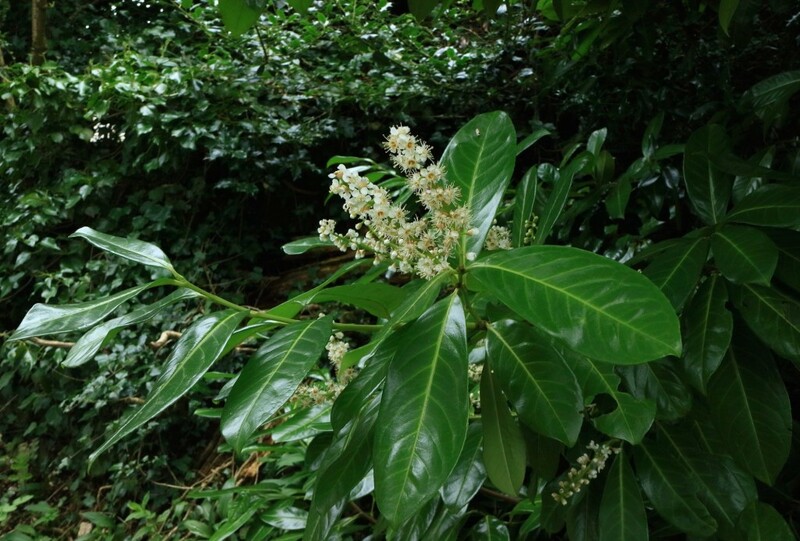 With similar flowering in racemes, Cherry Laurel, P. laurocerasus, and Portugal Laurel, P. lusitanica are both frequent in estate woodland, and can naturalize. They are evergreen, and do not strike one as being related to the above until the flowers are seen. Cherry Laurel has smooth-edged to bluntly-toothed leaves, and green leaf-stalks and young twigs, and when not flowering looks superficially much like Rhododendron. 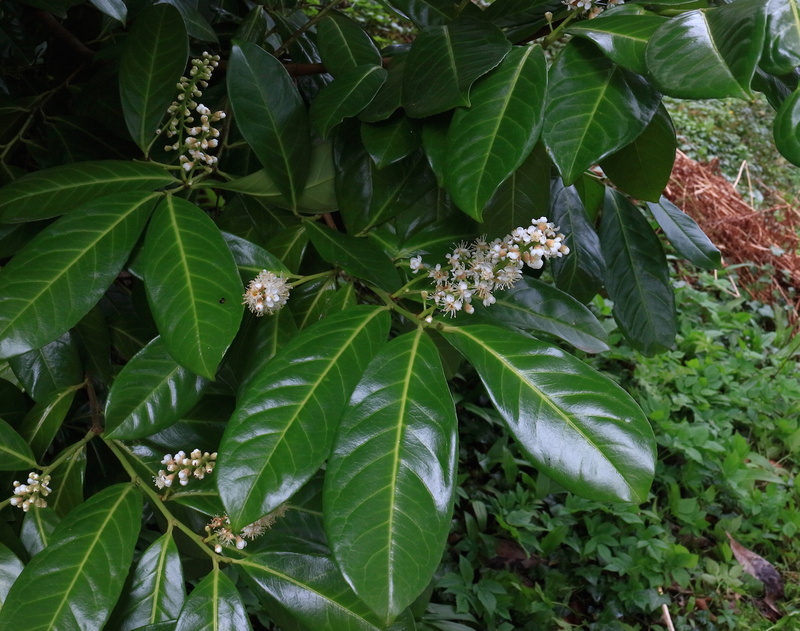 Portugal Laurel has more strongly saw-edged leaves with red leaf-stalks and young twigs. It flowers much later, in mid-July.